BOWLING GREEN, Ky. — The Bowling Green Area Chamber of Commerce Thursday night celebrated last year’s success at its 84th Annual Dinner at the Sloan Convention Center, where more than 635 local business leaders, regional partners and special guests were treated to a reception, dinner and program. 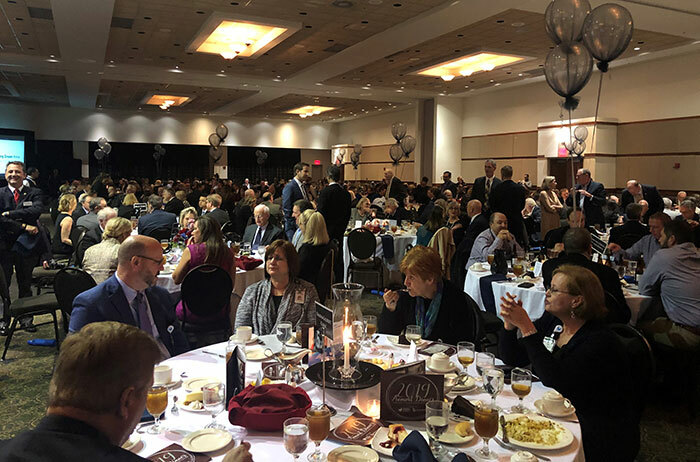 WBKO-TV’s multimedia journalist Sean Baute served as the event’s emcee, leading the audience through entertainment, ceremonies and speakers that recognized the many accomplishments of 2018. Five community leaders spoke about why Bowling Green received such a recognition, including Chamber CEO Ron Bunch, Mayor Bruce Wilkerson, Judge/Executive Mike Buchanon, Superintendent of Warren County Public Schools Rob Clayton, and Superintendent of Bowling Green Independent Schools Gary Fields. The evening’s theme was “Talent & Innovation” and celebrated the accomplishments of our over 1,300 partners, as well as the continual success we see in K-12 throughout our Lighthouse schools. In addition, the chairman’s gavel was passed through several past chairmen to 2019 board chairman Steve Davis of Crye-Leike Executive Realty. In his address to the audience, Davis thanked the partnership for making Bowling Green the progressive community that it is and outlined his vision for the upcoming year. In 2011, the Chamber established the Herb Smith Lifetime Achievement Award to recognize those who have made significant contributions to South Central Kentucky’s economy and who exemplify the chamber’s core values of inclusiveness, integrity, leadership and service. The dinner celebrated and honored the contributions of the late David Garvin. His son, also named David Garvin, accepted the award on his behalf. Also, Citizens First Bank, Bowling Green Metalforming, Fort Knox Federal Credit Union, Realtors Association of Southern Kentucky, BKD, LLP, Bowling Green Municipal Utilities, Stewart-Richey Construction, ADT Security, Houchens Insurance Group, Independence Bank, US Bank, TriStar Greenview Regional Hospital, Scotty’s Contracting, Bluegrass Supply Chain Services, BILSTEIN COLD ROLLED STEEL, Arnold Consulting Engineering Services, Henkel Corporation, WKU College of Business. To learn more about the Bowling Green Area Chamber of Commerce, visit www.bgchamber.com.